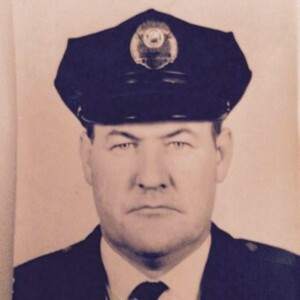 Earlier this year The Valley Patriot learned about Lawrence Police Officer Jeremaiah O’Connor had died in the line of duty back in the 1950’s but his sacrifice was never recognized. 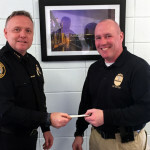 Officer O’Connor has since been declared a line of duty death and his family given the “last call” they deserved at The Valley Patriot’s charity BASH last March. Now, Lawrence has another name to add to the police memorial in Washington D.C., Officer Eugene Scanlon. In 1972, Lawrence Police Officer and hero veteran of WWII and Korea, Eugene Scanlon died as the result of injuries he sustained after being savagely beaten by four men in the parking lot of Central Catholic during a high school dance. Officer Scanlon didn’t die right away (he died ten days later) and his name has never been honored as a line of duty death. His family never received line of duty death benefits. 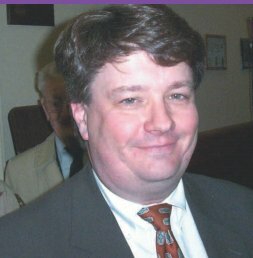 This month, the state legislature, through the efforts of Lawrence State Rep Frank Moran, has rectified that injustice as the house and senate voted unanimously to declare Eugene Scanlon’s sacrifice as officially “in the line of duty”. Governor Charlie Baker is scheduled to sign the bill next week. 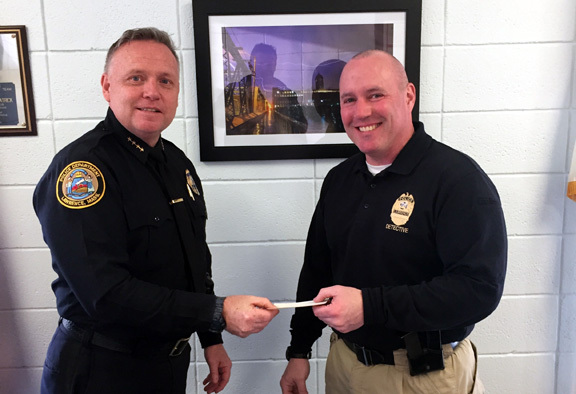 Just as Jeremiah O’Connor’s grandson Frank Daley became a Lawrence Police Officer, Scanlon’s son, Eugene also became a Lawrence cop and has been serving the public for more than 18 years. The younger Officer Scanlon says he never knew why his father’s death was not deemed “line of duty” back then, but that he had always wondered about it. Then, he recalls, a chance encounter with an old friend of his fathers set everything in motion. “It was a fluke really. I was in court with City Attorney Charlie Boddy on a firearms case. I’m the firearms officer for the department so we work on gun cases as he represents the city. “Attorney Bob Menasian was there, and Bob had tried to help us 45 years ago when my father was first assaulted. He really did a lot for us,” Scanlon recounted. A few months later Attorney Boddy had a resolution drafted for the city council, and in June of 2015 the Lawrence City Council approved a resolution declaring Lawrence Police Officer Eugene Scanlon a line of duty death. 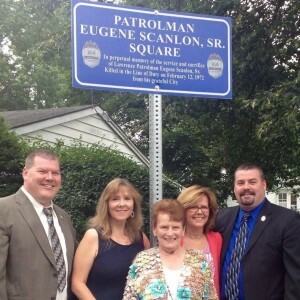 The city held a ceremony at City Hall and because of the efforts of Attorney Boddy, on July 4, 2015 a corner on Mount Vernon Street was dedicated in Officer Scanlon’s name. From there Attorney Boddy and the younger Scanlon worked on changing some of the wording from the city council resolution to see if the state legislature would then approve an official declaration that Officer Eugene Scanlon Sr. had died in the line of duty. “When he called me and told me the story I was all in with both feet. 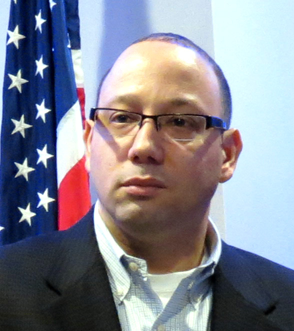 What a terrible tragedy,” Lawrence State Rep. Frank Moran said. Officer Scanlon said that he was really glad to see his father recognized while his mom was still alive to see it. Eugene says he never dreamed his father’s status could even be changed. Now, so many years later, Officer Scanlon says his father’s sacrifice will hopefully be added to the National Law Enforcement Officer’s Memorial in Washington D.C., where the names of every police officer killed in the line of duty has their name etched on a national monument. Lawrence Police Officer Eugene Scanlon had four children. Eugene Scanlon, Bill Scanlon, Susan Arenella, and Kathleen Phair. Scanlon’s mom Jane Scanlon is 86 years old and lives in Salem NH. Eugen Scanlon is the fourth police officer declared to have died in the line of duty in the City of Lawrence. The others are: Peter Manning (1954) killed by a drunk driver, Jeremiah O’Connor died of a heart attack, and Thomas Duggan, Sr. (1990) who was bludgeoned with a baseball bat. The details of Officer Scanlon’s murder will be published in the December, 2017 Valley Patriot. A bitter sweet story. I thank these brave-heroic men for their service and sacrifice, and send my condolences to all the families. Although I think the refusal of past-monetary benefits is comendable, the families deserve all the benefits, to say the least. Attorney Menasion & Attorney Boddy’s compassion and efforts are inspiring and we sure need more compassionate people. God works in mysterious ways, maybe the “chance encounter” was not a chance encounter at all.